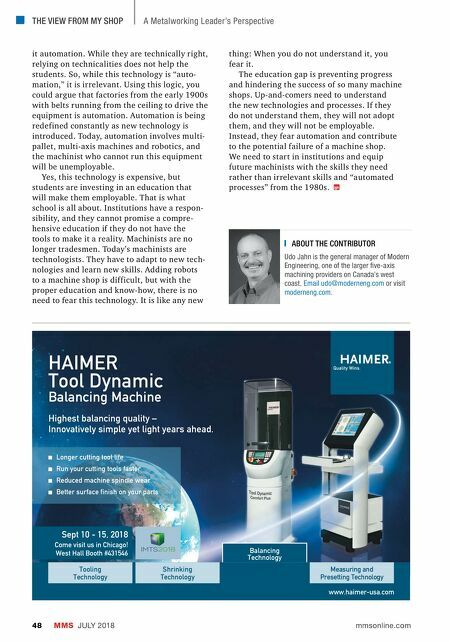 www.haimer.com Technology Shrinking Technology Tooling Measuring and Presetting Technology THE VIEW FROM MY SHOP MMS JULY 2018 48 mmsonline.com A Metalworking Leader's Perspective ABOUT THE CONTRIBUTOR Udo Jahn is the general manager of Modern Engineering, one of the larger five-axis machining providers on Canada's west coast. Email udo@moderneng.com or visit moderneng.com . Balancing Technology Technology Balancing www.haimer-usa.com Shrinking Technology Tooling Technology Measuring and Presetting Technology HAIMER Tool Dynamic Balancing Machine Highest balancing quality – Innovatively simple yet light years ahead. 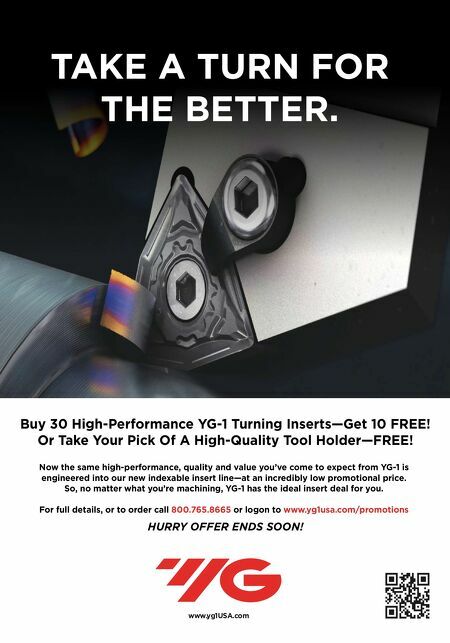 Longer cutting tool life Run your cutting tools faster Reduced machine spindle wear Better surface finish on your parts Sept 10 - 15, 2018 Come visit us in Chicago! West Hall Booth #431546 it automation. While they are technically right, relying on technicalities does not help the students. So, while this technology is "auto- mation," it is irrelevant. Using this logic, you could argue that factories from the early 1900s with belts running from the ceiling to drive the equipment is automation. Automation is being redefined constantly as new technology is introduced. Today, automation involves multi- pallet, multi-axis machines and robotics, and the machinist who cannot run this equipment will be unemployable. Yes, this technology is expensive, but students are investing in an education that will make them employable. That is what school is all about. Institutions have a respon- sibility, and they cannot promise a compre- hensive education if they do not have the tools to make it a reality. Machinists are no longer tradesmen. Today's machinists are technologists. They have to adapt to new tech- nologies and learn new skills. Adding robots to a machine shop is difficult, but with the proper education and know-how, there is no need to fear this technology. It is like any new thing: When you do not understand it, you fear it. The education gap is preventing progress and hindering the success of so many machine shops. Up-and-comers need to understand the new technologies and processes. If they do not understand them, they will not adopt them, and they will not be employable. Instead, they fear automation and contribute to the potential failure of a machine shop. We need to start in institutions and equip future machinists with the skills they need rather than irrelevant skills and "automated processes" from the 1980s.